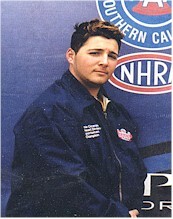 The 2004 season will mark Frankie's fifth year behind the wheel of a full size race car, and his third behind the wheel of the team's Super Comp Dragster. 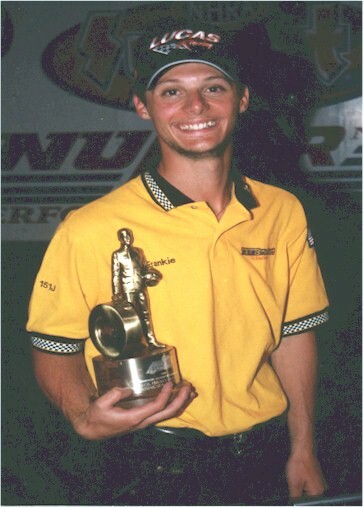 The 1999 season marked Frankies sixth and final season piloting the Tax Bracket Racing Jr. Dragster. He started in 1994 driving the Half Scale built Jr. Dragster. In 1995, he qualified for the Jr. Drag Racing League National Championships, and exited the race with 27 cars left in the field. He finished sixth in points that season at Island Dragway. In 1996, Frankie won the first race of his career, and went on to win three more times on his way to finishing third in the points chase at Island Dragway. He once again qualified for the Jr. Drag Racing League National Championships, and was the only one from his track to make it past the first round. 1997 was a remarkable year, with Frankie finishing second behind his brother in points at Island. He only won one race that year, but did so driving with a broken collarbone. He traveled to the Ziploc Indy Jr. Dragster Open held at Indianapolis Raceway Park, and went six rounds in the Friday night bracket race. 1998 was another spectacular year, with Frankie finishing second once again to his brother in points. With a career high five wins, Frankie again qualified for the National Championships and went three rounds before losing. 1999 was a banner year for Frankie. He again qualified for the National Championships, and went out in the fourth round with 13 cars left, but not before capturing the Best Reaction Time Award. He finished out the season with a career high six wins, and captured the Island Dragway Track Championship, his very first. He also finished fourth in points at Old Bridge Township Raceway Park, tied with his brother. 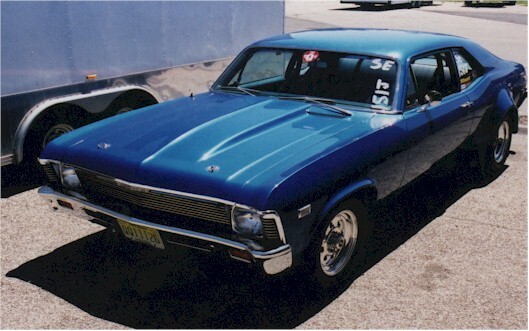 Frankie, who had previously raced to a best finish of runner-up in two appearances going the full 1/4 mile, raced his 1968 Chevy Nova for the points championship in the Street class at Island Dragway and Advanced Trophy at Old Bridge Township Raceway Park in 2000. At the end of the year, Frankie tallied up six victories, tying his career high. He finished fourth in Advanced Trophy points at Englishtown and sixth in Street class points at Island Dragway. In addition, he qualified for the 2000 Summit E.T. Racing Series Division 1 Bracket Finals, where he made it to the second round. Frankie avoided the sophomore jinx in 2001 as he had another great year. He competed in Super Comp driving the team's 1994 Pro Start dragster, and also piloted his venerable 1968 Chevy Nova in Street at Island Dragway. Frankie finished 22nd in Division 1 Super Comp points for the year, recorded the best package at the 2001 Matco Tools Spring Supernationals, and was a routine late round finisher at all Divisional events. In addition, Frankie finished second in Street points, missing the title by a mere seven points. He also went four rounds at the Bracket Finals and won the Best Package Award at that event. 2002 was a career year for Frankie as he won the two biggest events of his career. After late round finishes at most divisional events, Frankie went a tough seven rounds to take home the Super Comp victory at Cecil County Dragway in August. He came back to the track a month later to win the Summit E.T. Racing Series Bracket Finals driving John Zulla's 1982 Chevy Monte Carlo. In addition, Frankie racked up seven wins at Island Dragway to finish third in Street points, and used the Super Comp win to score a seventh place points finish in Division 1 Super Com points. In 2003, Frankie racked up a career low one win, but was consistent enough to finish sixth in Street Eliminator points at Island Dragway. Frankie handed off his divisional crown to his brother, who won the title in the same car Frankie drove to victory last year. While it was a frustrating year on the divisional circuit, Frankie did manage to score a semi-final finish at the Atco Open event in April, and used it as a springboard for a fourth place points finish in the Northeast Division National Open Series Super Comp points hunt. 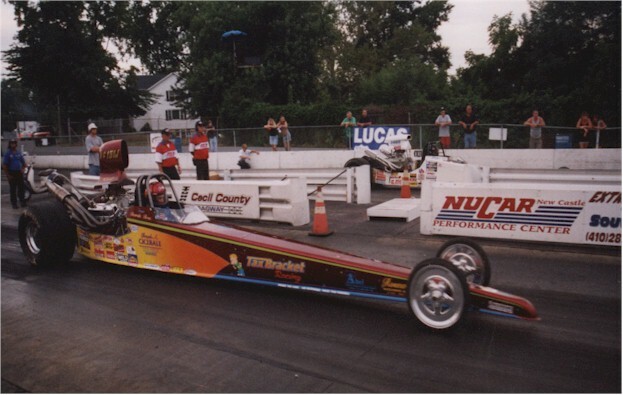 In addition to driving his Nova in Street at Island Dragway, Frankie will continue to drive the team's 1994 Pro Start dragster in Super Comp competition in the NHRA Division 1 Lucas Oil Drag Racing Series in 2004.